Jan van Dam (1947) settles as agricultural mechanisation company in a smithy on the Hamsestraat in Opheusden. From the tree nurseries in the direct neighbourhood came the question for specific solutions for this sector. The first own machine was the dirigible CDO-60 tree undercutting plough with the LR-3 cable winch in 1970. In the course of more than 40 years the company developed into a manufacturer of tree nursery machines. Beside it machines have been imported and sold in the Netherlands and surrounding countries. At the moment in the company are working about 20 employees. Due to a combination of disciplines we give an answer to every mechanisation problem. In the company a sales department, spare parts, repair and service department, construction workshop and a drawing-office are cooperating closely. This results in the delivery of a machine which comes up to expectations of the buyer. The quality and service of DAMCON have became a standard in the tree nursery. 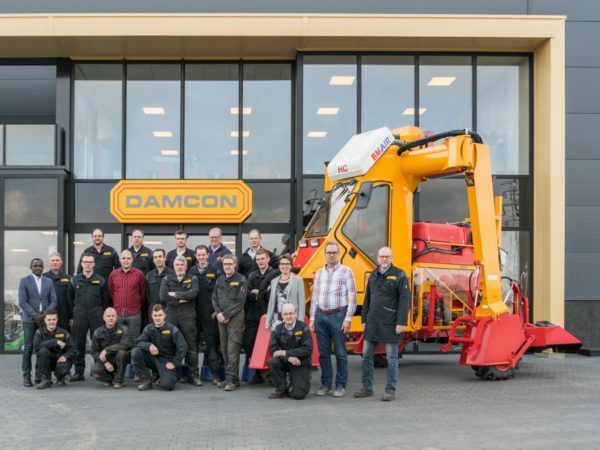 DAMCON delivers machines which are functional and reliable, pays very good and guarantees a long life. The founder, Jan van Dam, retired from the business on 1 May 2007. He continues to be involved as the owner. Gerrit Massink joined Damcon in 1998 as Technical Manager and is now responsible for the overall management of the company. Both sons Jan Jr. and Rico van Dam are active within the company and work in the warehouse and workshop.